The Honda Clarity is a nameplate used by Honda on alternative fuel vehicles. 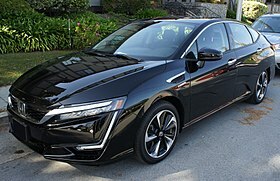 It was initially used only on hydrogen fuel-cell electric vehicles such as the 2008 Honda FCX Clarity, but in 2017 the nameplate was expanded to include the battery-electric Honda Clarity Electric and the plug-in hybrid electric Honda Clarity Plug-in Hybrid, in addition to the next generation Honda Clarity Fuel Cell. The Honda FCX Clarity is based on the 2006 Honda FCX Concept and only available as a hydrogen fuel-cell electric vehicle. The FCX Clarity had electric car qualities such as zero emissions while offering five minute refueling times and long range in a full function large sedan. It was the first hydrogen fuel cell vehicle available to retail customers. The electric motor is based on the motor used in the EV Plus, rated at 134 horsepower (100 kW) and 189 lb⋅ft (256 N⋅m) torque @0-3056 rpm. The range on a full hydrogen tank (4.1 kg @ 5000psi) is EPA certified at 240 miles (~386 km). The vehicle is estimated to get about 77 miles (123.9 km) per kilogram hydrogen in the city, 67 miles (107.8 km) per kilogram highway and 72 miles (115.9 km) per kilogram in combined driving. The FCX Clarity was produced in Japan at a dedicated fuel-cell-vehicle assembly line in the Honda Automobile New Model Center (Takanezawa-machi, Shioya-gun, Tochigi Prefecture). The fuel cell stack itself is produced at Honda Engineering Co., Ltd. (Haga-machi, Haga-gun, Tochigi Prefecture). 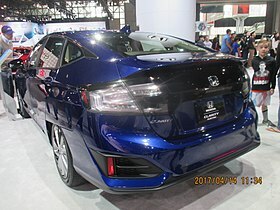 In April 2016, Honda announced that in addition to the new generation Clarity Fuel Cell there are two additional variants - the Clarity Electric and Clarity Plug-in Hybrid, which were both released in 2017. The all-electric Clarity EV with a 25.5 KWh battery has 89 miles (143 km) of range, and is only available for a three-year lease (US$199/month with US$899 down) for residents of California or Oregon. For the US market, the Clarity Electric is equipped with SAE J1772-2009 (Type 1) receptacle for 120-240 V Level 1 and 2 AC charging, and associated Combined Charging System for DC fast charging. Approximate charging time at 240V is 3.5 hours and 19 hours at 120V. The plug-in hybrid (PHEV) model was launched December 1, 2017 in the U.S. market with a starting MSRP of $34,290; it is eligible for up to a $7,500 federal tax credit in the U.S., along with other incentives for plug-ins in certain states. This model is the only Clarity model to be available for sell on all 50 U.S. states. The plug-in hybrid has an EPA-rated all-electric range of 47 miles (76 km), with a total combined gas/electric range of 340 miles (550 km), and is the only Clarity model available in all 50 states as well as Canada; it was launched nationwide in the latter on December 14, 2017 starting at an MSRP of C$39,990, before available government incentives up to C$13,000. For the US market, the Clarity Plug-in Hybrid is equipped with SAE J1772-2009 (Type 1) receptacle for 120-240 V Level 1 and 2 AC charging. Approximately 13 hours at Level 1 and 2.5 hours at Level 2 are needed to charge Clarity Plug-in Hybrid's battery to full. The following table shows fuel economy ratings from the United States Environmental Protection Agency test procedures for both the 2014 FCX Clarity and the 2017 Clarity Fuel Cell, expressed in miles per gallon gasoline equivalent (MPGe). One kg of hydrogen is roughly equivalent to one U.S. gallon of gasoline. On 25 July 2007 the United States Internal Revenue Service announced that the Honda FCX Clarity met the requirements of the Alternative Motor Vehicle Credit as a qualified fuel-cell motor vehicle. Purchasers of the 2005 and 2006 Honda FCX were eligible for a US$12,000 Section 30B(b) income tax credit, but consumers were not allowed to purchase the vehicle, as it was only available leased in Southern California, where public hydrogen refueling stations are available. The tax credit expired in 2014. The Clarity Fuel Cell is eligible for a federal tax credit of US$8,000, as the tax credit for fuel-cell vehicles was given in December 2015 a short-term extension through the end of 2016. As a zero-emission vehicle (ZEV), the Clarity FCV is eligible for a purchase or lease rebate in California of US$5,000 through the Clean Vehicle Rebate Project. However, Honda only currently offers the Clarity FCV for lease, so the federal incentives are retained by Honda rather than the lessee; leasee is able to receive the CVRP rebate from California. Wikimedia Commons has media related to Honda FCX Clarity. 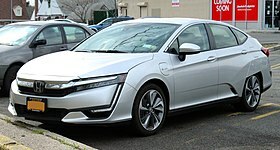 Wikimedia Commons has media related to Honda Clarity FCV. ^ "Overview of Honda Clarity". ^ "2016 Honda Clarity hydrogen fuel cell sedan: First impressions". ^ a b Millikin, Mike (2016-12-20). "Southern California customers take delivery of new 2017 Honda Clarity Fuel Cell sedan". Green Car Congress. Retrieved 2016-12-24. ^ "Clarity Plug-in Hybrid Specifications and Features". automobiles.honda.com. Retrieved 2018-04-04. ^ "2018 Honda Clarity Plug-in Hybrid Pricing to Start at $33,400 - Honda.com". news.honda.com. Retrieved 2017-12-18. ^ "Honda Worldwide | September 12, 2017 2018 Honda Clarity Plug-in Hybrid Achieves Class-Leading All-Electric Range". world.honda.com. Retrieved 2017-12-18. ^ Inc., Honda Canada. "Honda Canada". www.honda.ca. Retrieved 2017-12-18. ^ "CVRP Eligible Vehicles". California Clean Vehicle Rebate Project. Center for Sustainable Energy. Retrieved 2016-12-24. ^ Evan McCausland (2011-03-09). "H2 Racer: Honda FCX Clarity Will Serve as IndyCar Pace Car". Automobile magazine. ^ "Honda FCX Clarity Named 2009 World Green Car" (Press release). Honda Motor. 2009-04-09. Archived from the original on 2010-06-05. Honda FCX Technology FCX homepage (Japanese).